As the East Coast is left reeling from Sandy, West Virginia is experiencing a storm that has dropped almost two feet of snow on some areas and is expected to intensify before it gets better. The Weather Channel's Janel Klein reports. 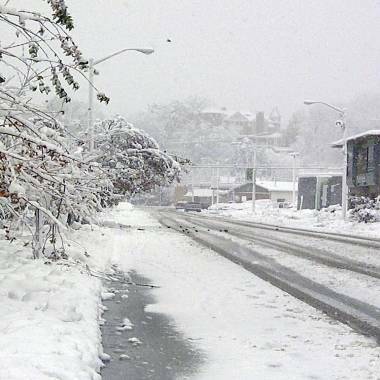 Snow covers the streets Tuesday, after Superstorm Sandy moved through Elkins, W.Va. Sandy buried parts of West Virginia under more than a foot of snow on Tuesday, cutting power to at least 243,000 customers and closing dozens of roads. At least one death was reported. Wet snow and high winds spinning off the edge of Superstorm Sandy spread blizzard conditions over parts of West Virginia and neighboring Appalachian states Tuesday, shutting one interstate as trucks and cars bogged down and knocking out power to many. The National Weather Service said more than a foot of snow was reported in lower elevations of West Virginia, where most towns and roads are. High elevations in the mountains were getting more than two feet and a blizzard warning for parts of the state was in effect until Wednesday afternoon. Nearly 265,000 people in West Virginia were without power on Tuesday morning, according to The Charleston Gazette. In Elkins, a city of about 7,000 people, power went out across town before dawn and the only lights were from passing snow plows as heavy, wet flakes piled up to about 8 inches. On the Maryland side, crews were trying to remove several tractor-trailers stuck on the highway. Four or five passenger vehicles also were abandoned in the median, State Highway Administration spokeswoman Kelly Boulware said. The higher elevations in western parts of Maryland received more than a foot of snow since Monday afternoon, and it was still snowing Tuesday before dawn, Boulware said. Police rescued several stranded motorists on the interstate in West Virginia, according to a spokeswoman for the state's Department of Homeland Security and Emergency Management. Fred Brugge of Lexington, Ky., clears snow from his car windshield on Tuesday, at Jenny Wiley State Resort Park at Prestonsburg in eastern Kentucky. Snow settled in across portions of Kentucky's Appalachian region as part of Superstorm Sandy hitting the eastern U.S.
Officials in West Virginia said a woman was killed Monday in a storm-related traffic accident. A spokeswoman for Gov. Earl Ray Tomblin said about 5 inches of snow had fallen in the area of Tucker County where the crash occurred, making road conditions treacherous. A West Virginia state official told The Charleston Gazette that it's better if people stay off the roads. "It's hazardous out there. It's definitely not over," state spokeswoman Leslie Fitzwater told the Gazette. "Stay in if you can, don't venture out. We need the roads open for first responders to get out there and do the work they need to do." 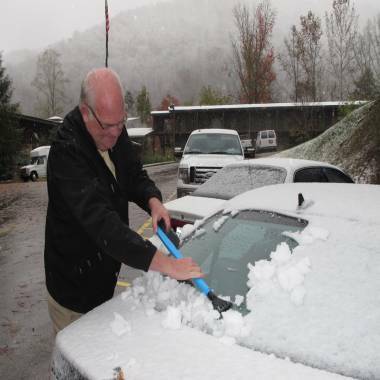 A significant winter storm continued in northeast Tennessee and the Great Smoky Mountains, where the National Weather Service forecast continuing snow showers over the higher elevations through Wednesday morning.